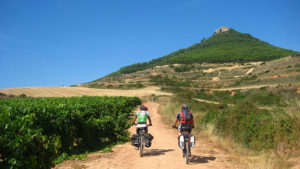 "The team at Camino Ways are unbelievably helpful - from advice on planning our trip, to recommending the most amazing places to stay, from helping out once the trip started - including arranging a birthday party, booking last minutes bikes for a day and managing four different groups of friends who wanted to join us at different points on the trip. I would highly recommend for anyone who wants a flawless pre-booked trip. Could not praise them enough!" "To be able to take part in this walk was a privilege...to be able to do it with the assurance that at the end of each day I would reach a comfortable bed and breakfast and have my luggage transported there was a bonus. I would recommend this company to anyone, but particularly for solo walkers who are travelling on to other countries and have luggage with them." The Camino Francés is the most famous Camino route, walked by millions of pilgrims from all over the globe since the Middle Ages. 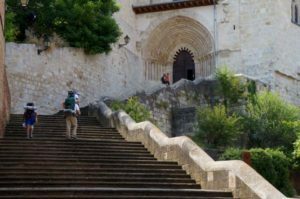 More than just a pilgrimage, the Camino is a very unique social and cultural experience, and a truly memorable adventure. 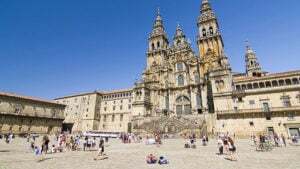 Step back in time and follow in the footsteps of medieval pilgrims, walking the full Camino Francés from St Jean Pied de Port in the French Pyrenees to the stunning cathedral of Santiago de Compostela, in Galicia, where St James is believed to be buried. Breathtaking scenery, towns and cities full of history and quaint villages will be part of this extraordinary journey: From the phenomenal views of the Pyrenees to the vineyards of La Rioja, from the lively tapas bars of Burgos to the magical beauty of O Cebreiro. 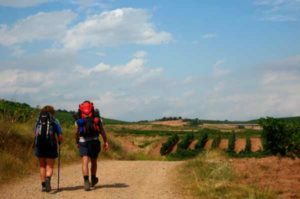 A life changing experience for many, the essence of the Camino de Santiago is about enjoying each step of the journey: The fellow pilgrims you will meet and the camaraderie you will encounter along the way will make this trip simply unforgettable. 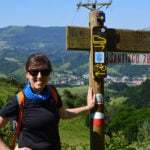 The most famous Camino route of all gets 5 stars from regular walkers. 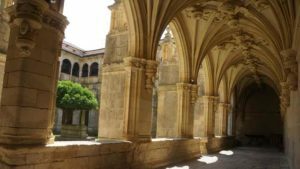 *Note that in order to receive your Compostela Pilgrim Certificate in Santiago you must walk at least the last 100kms (from Sarria) or cycle at least the last 200kms (Ponferrada) of the route. You arrive in Saint Jean Pied de Port. 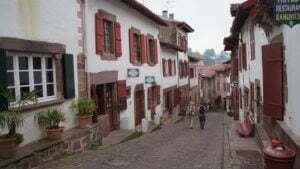 The French Way, Camino Francés, starts in St Jean Pied de Port in the French Basque Country. Your Camino begins after your night in Saint Jean Pied de Port. This is one of the most challenging but beautiful parts of the route, especially if you take the ‘Napoleon Route’ over the Roncesvalles Pass (1450m). 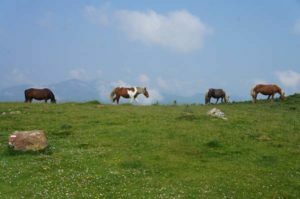 The ‘Napoleon Route’ starts with a steep climb past country houses before reaching mountain meadows, the cross and some spectacular mountain views. The views of the Pyrenees are worth the effort! Easy Option: You can split the long stage from St Jean Pied de Port to Roncesvalles into two stages of 12km and 13km, if you would like to walk at a more relaxed pace. You would stay overnight in the village of Valcarlos. We would recommend taking this option during the winter months when snow can make the higher route impassable. 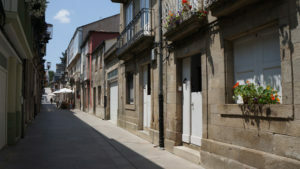 Roncesvalles (‘Orregaga’ in Basque) is a popular Camino starting point for Spanish pilgrims. 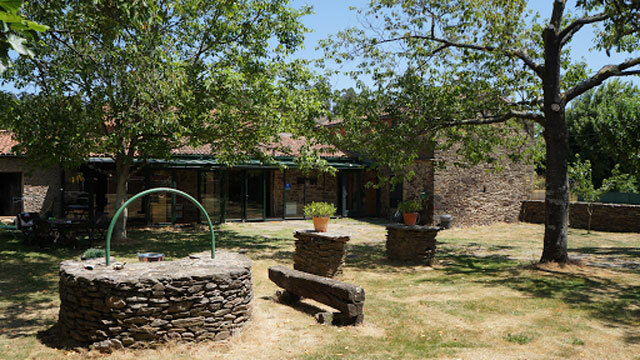 Here you should visit the St James chapel, as well as the Royal Collegiate Church of Saint Mary. After your night in Roncesvalles, the Camino de Santiago French route continues through beech and oak woods before entering Espinal. You will also cross two mountain passes: Alto de Mezquiriz and Alto de Erro. 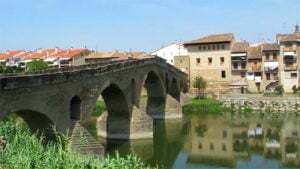 You will then descend towards the village of Zubiri and its medieval ‘Puente de la Rabia’ (the Rabies Bridge) over the River Arga. 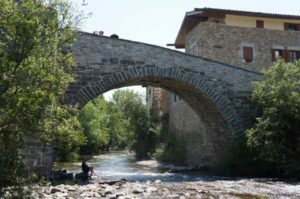 After your night in Zubiri, the Camino de Santiago follows the river Arga to the town of Larrasoaña, an important stop for pilgrims in Medieval times. 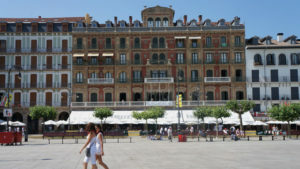 The second half of the day will get busier, as you approach the bustle of Pamplona city. Famous for its Running of the Bulls festival, San Fermín, taking place in July, Pamplona has many other attractions to visit. 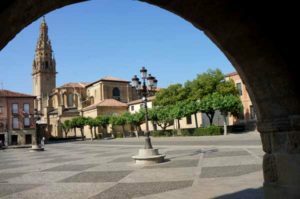 Explore the city’s medieval streets, visit the cathedral, taste some of the fantastic local food and wine and Hemingway fans can go for a coffee in one of the writer’s favourite haunts in the main square: Plaza del Castillo. 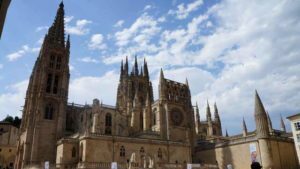 Take some time to explore Burgos: admire the beauty of its historic centre, enjoy a stroll along the magnificent promenade by the river and taste delicious local tapas in the old town. Burgos has been referred to as the Gothic capital of Spain and the citys cathedral is probably one of the most impressive in the country. 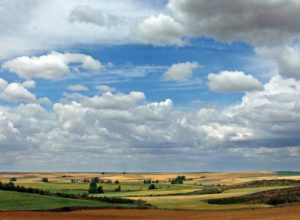 After your night in Burgos, your Camino will continue along earthen tracks, among the immense crop fields of the region. 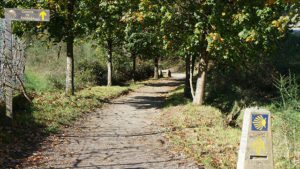 On your way to Hornillos del Camino, you will cross small woods of holm oak and conifers but in general there is little shade along this stretch of the Camino de Santiago so make sure you take enough water with you, as well as hat and sun cream. 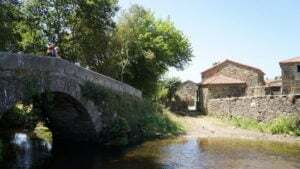 Hornillos del Camino, with only 70 inhabitants, is a classic Camino village of medieval origin. After your night in Hornillos del Camino, you will continue walking in the peaceful vastness of the Meseta, with only nature and huge crop fields around you. 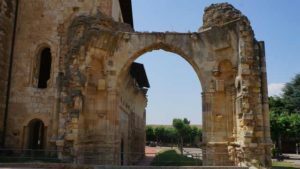 After leaving Hornillos, the Camino de Santiago gradually climbs up a plateau before descending to the valley of the River Bol and the pretty town of Castrojeriz. 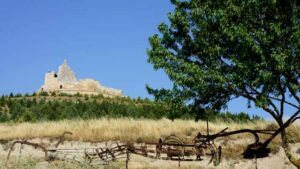 In Castrojeriz, you can visit the 9th century hilltop castle, recently reopened to visitors. Castrojeriz celebrates its Garlic Festival in July. 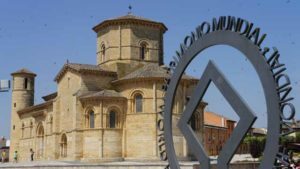 After your night in Castrojeriz, your Camino will leave the final plains of the Burgos region and reach the highest point of the Meseta: Alto Mosterales. After crossing the Pisuerga River you will enter the Palencia province and the vast plains of ‘Tierra de Campos’, the Land of Fields, and you will soon understand why. Stop to visit the 14th century church ‘La Asunción’ in Boadilla, famous for its Gothic architecture and the gorgeous carved baptismal font. Approaching Frómista you will walk along a stretch of the Canal de Castilla, a 18th century canal. Visit the beautiful 11th century Church of St Martin in Frómista. 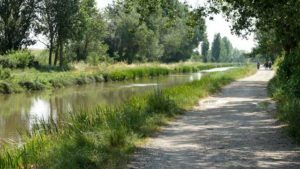 After your night in the town, your Camino trail takes you along a track parallel to the road, but you can take an alternative more scenic route at Población de Campos, via Villovieco, along the peaceful banks of the Ucieza River. You will rejoin the Camino at Villalcázar de Sirga and finish your day’s walk at Carrión de los Condes. After your night in Carrion de los Condes. Visit the impressive San Zoilo Monastery. 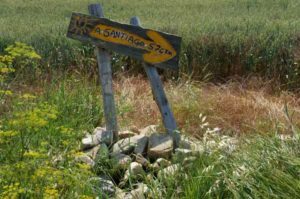 For 13km, your Camino will follow natural tracks along the old Roman road called ‘Via Aquitania’ and also along a stretch of the original paved road. The ‘Via Aquitania’ used to link Bordeaux and Astorga and was frequently used by French pilgrims on their way to Santiago. 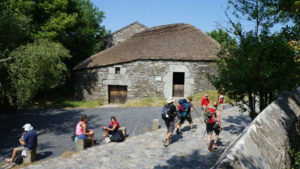 After your night in Calzadilla de la Cueza, your Camino today is full of ‘cuezas’ or little valleys, so some of the walking may be slightly tougher than the previous days. 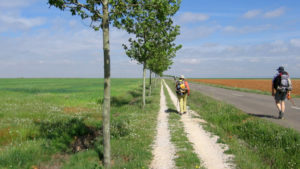 The Camino route moves away from the road and continues along nice peaceful oak woods before emerging to cereal fields. 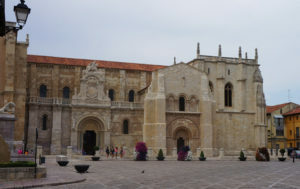 You will cross the river Valderaduey into the León province and head to Sahagún where the church of San Lorenzo is well worth a visit. 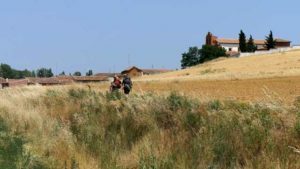 After your night in Sahagun, your Camino leaves the vast ‘Tierra de Campos’ behind and continues across cereal and grain crops, taking pilgrims to the plateau of León. 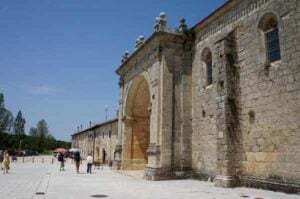 Today, you will pass the pretty village of Reliegos on your way to El Burgo Ranero. 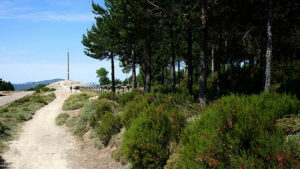 Also on this section of the Camino, you will have the opportunity to take the ‘Via Traiana’ which is another trail to Santiago, starting in Bordeaux. After your night in El Burgo Ranero, an easy walk awaits you today. Your path continues through the village of Reliegos before descending slowly into the town of Mansilla de las Mulas. After your night in the town of Mansilla de las Mulas, you will walk passed crop fields before spotting the first signs of industrial activity further on, as you approach the city of León. From Portillo Hill onwards you will be able to spot the beautiful city of León ahead. After your night in León, your Camino will continue through beautiful Spanish countryside. You will be happy to know that, the Camino from León is pretty flat and easy. 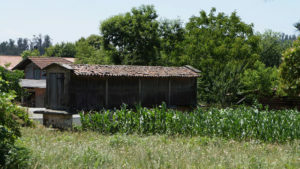 You will walk along crop fields: grain, corn, potatoes… and pretty apple orchards can be seen along the way to Mazarife. 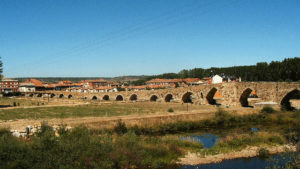 After your night in Mazarife, with the suburbs of León city long behind you, you will start a pretty hike along footpaths and dirt tracks towards one of the prettiest villages on the Camino: Hospital de Órbigo where you will cross the famous and picturesque ‘Puente de Órbigo’ bridge, before continuing onto Astorga. Easy Option: Split your long day above between Mazarife and Astorga into two stages of 14km and 17km, if you would like to walk at a more relaxed pace. 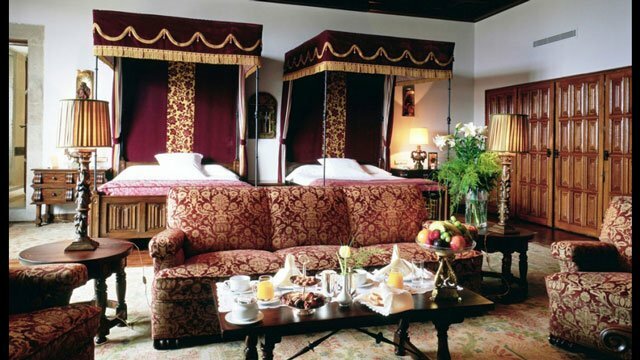 You would stay overnight in a charming hotel in the town of Hospital de Órbigo. After your night in Astorga, you will gradually make your way up towards the stunning León Mountains and the lush Bierzo region, taking paths surrounded by broom, heather and oak trees before reaching Rabanal del Camino. After spending the night in Rabanal del Camino, this is one of the most rewarding days ahead on the Camino as it climbs to ‘Mount Irago’. 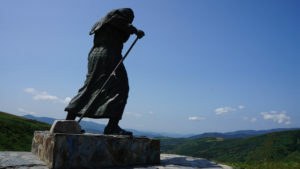 Stop at the Iron Cross on top of the mountain, one of the most special places on the French Way, where you can place a memento and visit the St James chapel before descending to the lush area of El Bierzo. On your way to Ponferrada, pass through the lovely town of Molinaseca. 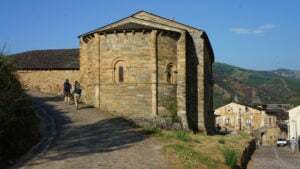 Once in Ponferrada, you should explore the old town, its impressive 12th century Templars Castle, and make sure you try the local specialities, such as botillo and some of Spain’s most delicious cured meats. 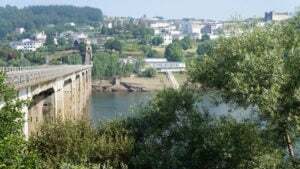 Easy Option: You can choose to split your long day above between Rabanal del Camino and Ponferrada, into two stages of 16km each, if you would like to walk at a more relaxed pace. 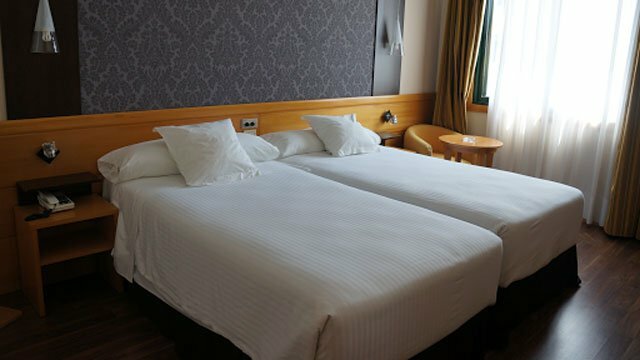 You would stay overnight in a charming hotel in the pretty mountain village of Acebo.